Synthetic oil is different from conventional oil. 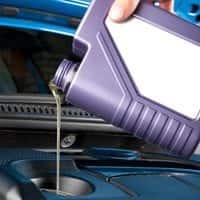 Synthetic oils work well while in both low and high temperatures.When temperatures begin to drop and conventional oil might not flow as easily through engine's lubrication system, synthetic continue to keep its viscosity. This article will discuss why synthetic oil works well in the winter. All engine oil is made up of base oils and additives. Synthetic oil is a different mixture of synthetic fluids and selected additives combined in order to modify the viscosity grade.This allows synthetic oil to operate efficiently in high and low temperatures. For winter weather we will concentrate on what happens in low temperatures. In low temperatures synthetic engine oil can flow better through the engine lubrication system thus allowing the car owner to be able to crank the car in the lowest of temperatures. For anyone who lives in a cold climate they know getting a car started in cold temperatures can be half the battle. The quicker the oil pumps through the engine the faster the car can be started and the heater can be turned on. Synthetic oil has friction modifiers as an additive which allows for more horsepower but with better fuel economy. Though you may not be driving as much during the cold winter months it is likely the car will spend a lot of time warming up and thus guzzling gasoline during that time period. Synthetics motor oil's main reason for working so well in the winter is because of its abilities to withstand the extreme temperature lows. The chemical makeup of the synthetic keeps the lubrication fluid less likely to congeal or freeze up. The better flow allows the engine to work better in lower temperatures. Changing from conventional to synthetic oil can be a wise choice for the winter. If you live in an area that often has prolonged cold snaps there are many advantages for you and your vehicle. The main point is that because synthetic motor oil can flow well in low temperatures allowing your car to start on the coldest of days. The car cranks and starts quicker which will reduce the power needed by both the starter and battery. This allows extra strain to not place on either of these parts. With an easier start you engine should be found to be more reliable and durable. A durable engine will get you through the cold winter months and into the warmth of spring and summer. Synthetic oil won't get you car insurance discounts, but a car in top shape -- with the documents and photos to prove it -- will get a bigger check if it is ever stolen or totaled. 1 Responses to "Why synthetic oil works well in the winter"
Synthetic oil is the best option for the lubrication of the machines.